I enter a perfectly normal airplane at a perfectly normal airport and I sit down in a perfectly normal seat. However, so long as I am sitting in this seat, the plane will not start. I'm not in the pilots or co-pilot's seat, and as I am a perfectly normal man, I could definitely be in this seat, but apparently not today. I'm not in an emergency aisle Everyone is on board, including the flight attendants, passengers, pilot, and co-pilot. There is nothing obstructing the plane and the runway. But as long as I sit in this particular seat, the plane will not start. Additionally, the plane is cleared for take off. There is nothing wrong with anything outside of the plane, or with the plane itself. Everyone who is supposed to be in the plane is inside the plane, and no one else is. I'm not a child, and I'm in perfectly good health. The pilot/crew are free to get to wherever they want, and the airline has no seat restrictions. There is no one else in my seat. The airline/airport is not preventing any takeoff. the pilot sitting in one of the passengers' seats. are a baggage handler, sitting in a perfectly normal seat, possibly a nice armchair, which has been loaded into the cargo hold. The plane can't take off whilst you are there, but if the seat was in you living room, you'd be fine. You're allowed onto the plane to load the baggage, but don't have a ticket. You are sitting on the toilet seat and the plane is not allowed to take off. 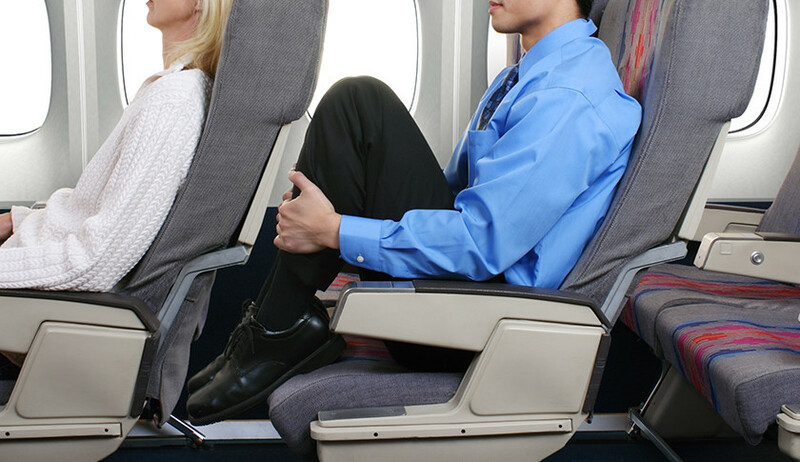 You are sitting in one of the seats the flight attendants use when taking off or landing. Again regulations prohibit you from doing this. You are in a wheelchair aboard the plane. pilot is sitting by the window and you are blocking him. When you get up, pilot is free to go and he can start the plane! 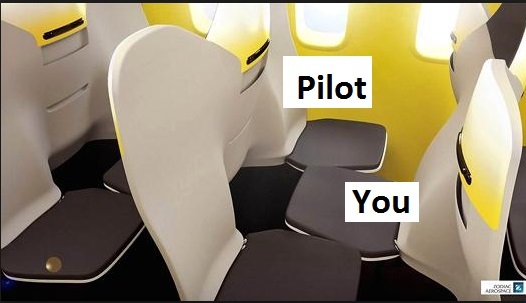 Although picture above is from concept plane seat layout and does not classifies as perfectly normal airplane, most of airplanes have very small amount of seat space, making impossible to get out of windows seat without disturbing neighbor. People saying that you are in the pilot's seat or flight attendants...it's exactly the other way!! You are a flight attendant and are in a normal seat, so the flight won't take off until you go to your corresponding seat!! I could definitely be in this seat, but apparently not today. You could sit there any day you are a normal passenger, but not today, today is a workday for you and MUST sit in your flight attendant seat! If first one was wrong, then I have to say air controller. Same reasons apply. you could be dead or drunk. Both are "perfectly normal" things for a man, but the pilot won't go forward with you in that state today. if you're dead you have to be stowed, not sitting in the seat. You could sit there when you're sober or alive, but not today. Also you could just be a passenger sitting in the wrong seat - as some airplines insist people are correctly seated for take off (so they can identify missing people (or bodies in a crash)). you don't need to be anyone particular, and you could have had this seat on another day. But today your seat is another seat, so until you stop being annoying and move to your allocated seat for takeoff the pilot can't move onto the runway for taxiing or takeoff...despite having clearance from the tower to do so. The plane has just arrived, I need to get off the plane so it can start. child, which needs a special children seat with special belts. I enter a perfectly normal airplane at a perfectly normal airport and I sit down in a perfectly normal seat. You entered it with your parents and were sat down by them. However, so long as I am sitting in this seat, the plane will not start. As long as you are not in a special seat that fits your age, the risks are too high, so the pilot/crew are not allowed to start. I'm not in the pilots or co-pilot's seat, and as I am a perfectly normal man, I could definitely be in this seat, but apparently not today. You are in your own 'normal' seat and in the future you are allowed to sit there (becoming older), but not today. I'm not in an emergency aisle. Everyone is on board, including the flight attendants, passengers, pilot, and co-pilot. There is nothing obstructing the plane and the runway. But as long as I sit in this particular seat, the plane will not start. Yes, I am allowed to be in the plane. However, no, I do not necessarily have a ticket. The pilot's ex. He/She(The pilot) doesn't want you to be onboard, So the pilot won't start the plane unless you get out of the plane. You are in the toilet seat, with someone in the toilet the flight won't take off. You're one of the ground crew. You can come on to the plane to do tasks/whatever, but there's something you need to do outside before the plane can take off.